Comments: Beautiful artwork, quirky characters, and an interesting story make this a fun read for any fantasy enthusiast. Demons. Fearsome beings that surpass humanity in strength, intelligence, longevity, and cunning. These creatures cause the mightiest warriors to tremble in fear, especially in the century that has passed since the savage Hangma War. During that time, clerics fought against demons for decades, only stopping after the gods themselves deigned to intervene. Even more impressive, more frightening, than a demon, however, are the higher-ups known as demon lords. They are born destined to reign over their lesser brethren, and thus far surpass humanity in many ways. Demon Diary is the story of a young demon lord named Raenef under the tutelage of the ancient and fearsome demon, Eclipse. Yet, where a demon is supposed to be ruthless and cruel, Raenef is kind and forgiving. Instead of being sinister with a razor sharp wit, the young lad is innocent and slow to catch on. Much to the dismay of his tutor, Raenef is everything a demon isn't supposed to be. For example, when a knight named Erutis stumbles into Raenef's castle, rather than subdue the woman with his powers and slowly torture her to death, Raenef takes her on as a page. From the moment Eclipse discovered Raenef, the other demons have mocked the elder fiend because of his feeble charge. No matter how horrible Raenef is at being a demon lord, though, he continues to strive to fulfill the hopes and dreams of his teacher. Thus, we have the groundwork for a series that boasts a good blend of comedy, fantasy, horror, and classic coming of age tales. In this, the second volume of the series, we learn more about how Eclipse discovered Raenef in the first place, and new characters are introduced, though whether they're allies or enemies remains unclear. Personally, I enjoyed this volume a bit better than the first. Both featured a good amount of humor, which isn't necessarily all that hard to pull off given the characters the Lee Yun Hee has come up with. The arsenal of characters is packed with pretty boys, and I have to admit I still can't look at Raenef and not see a girl rather than a guy. So long as you don't mind gender confusion, the character designs are all very attractive, and the artwork is rather impressive. Demon Diary is a sharply illustrated work, with good black and white contrast and some nice shading throughout. TOKYOPOP published the book in their now standard format, and it reads left to right since it's a Korean manga. 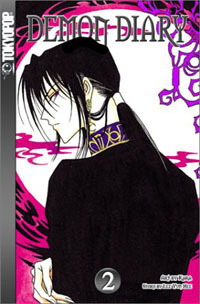 Just as the first volume, the cover is extremely eye-catching, with a bright pink highlight surrounding a profile image of Eclipse. There's a reason why this title is so popular with the ladies (it is in my area, at least), and putting the good-looking guys on the cover seems to be working well thus far. There isn't much in the way of extras, and in the future, I think I'd like to see more information presented about the artist and author involved with the production of the work, but that's hardly to be expected at this point. For an engaging fantasy story with demons as the main protagonists, Demon Diary is a sure bet. It doesn't skimp on the humor and yet remains dramatic as the plot advances. I'm looking forward to the next volume of the series.